The Autobiography of St Ignatius records his great devotion to the Holy Trinity. One particular elevation of his understanding of the Holy Trinity happened on the steps of the Monastery of St Clare, not far from La Cova Retreat Centre. Here is how this is reorded in the autobiography. “One day while saying the Office of Our Lady on the steps of the Monastery of St Clare, his understanding began to be elevated as though he saw the Most Holy Trinity in the form of three musical keys. 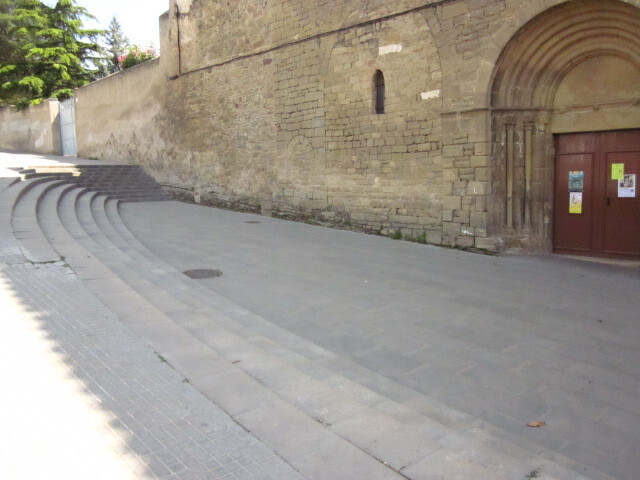 This brought on so many tears and so much sobbing that he could not control himself…As a result, the effect has remained with him throughout his life of feeling great devotion while praying to the Most Holy Trinity.” [28:3-5] The photograph shows the steps at the entrance to the Monastery, where this elevation of understanding is said to have occurred. Local lore says that the saint used to sit at the entrance often listening to the singing of the nuns.